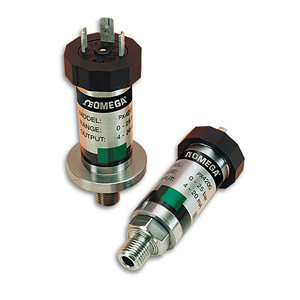 OMEGA's PX4200 Series Transmitters bring state-of-the-art Silicon-on-Sapphire (SOS) sensor technology to the industrial arena. SOS construction uses very stable solid state silicon strain gages on a Sapphire carrier which is glass bonded to a titanium diaphragm. This combination provides a very durable transducer which has excellent stability and corrosion resistance over a wide temperature range. A loop powered 3½ digit (-1999 to 1999) plug-on display adds versatility to the PX4200 by providing local display plus an available open collector set-point with 60 mA capability. The PM1000 plug-on display is a local display suitable for the PX4200 series pressure transducers. The plug-on display is simply plugged in between the transmitter connector plug and socket and is then ready for operation. Directly from this unit, the following parameters can be set: zero, scale, decimal point position, damping and switching set point (PM1001 only).